Lock in a great price for Cheathata Suites Hotel – rated 9 by recent guests! Everything! A big 10! 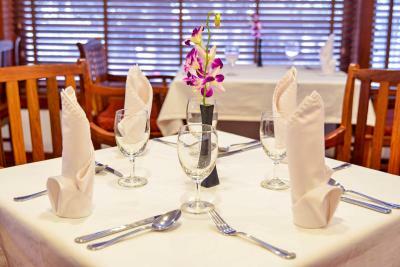 Very friendly and helpful staff, a nice room and very clean, and they have cleaning daily. Close to the pub street, just 100 meters, close to the cheapest massage :)). A good breakfast and free shuttle to/from airport. Great location, easy walk to Pub Street and all the various night markets in the area. Staff were very friendly and helpful. Free airport pickup and drop off was really useful. Room was large and clean. Pool area was great with lots of shade. Location - It was a few steps away from Night Market and Pub Street. Ambiance - the interior of the hotel is so good as if you’re in a palace or somewhere grand. 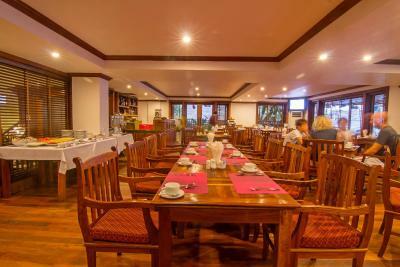 And there are variety of foods you can choose from the breakfast dining hall. We stayed in suite with balcony, upgraded from windowless room and enjoyed the room very much. Room was spacious with amenities we like. TV has many English channels, AC is controllable so we dont get too cold or too hot in the middle of the night. We like location close to night market, food & shopping place. We enjoyed spa and restaurant close to hotel. Airport pick up and drop off were also a big plus. Sam - the lady who picked us up was awesome, gave us all the information we needed, very helpful and friendly. I enjoyed the rooftop pool although a bit weird with color changing in the pool while swimming in the evening. The location was close to pub street. The pickup and airport drop of service was excellent. I actually changed our departure time, without issue that day!!! The hotel sent a car to pick us up at the bus station when we arrived in Siem Reap. The location is near the night market. Our room was big and the beds were comfortable . The bed was very comfortable. Staffs are awesome, they made you feel at home, safe and relax. They can arrange tours too. We decided to hire a car with a driver to drive us at the temples for the whole day. It cost 30usd, excluding the tickets. You have your own time to check the temples and take pictures, if you want guide, you'll find many of them once you arrived at the temple. They'll tell you the history. They have pool and bar at the rooftop with good view of the sunset. Breakfast was really nice.. foods are good.. Location is in the centre.. night market is less than a minute walk. Many restaurants around the area, atm is 3 mins walk.. pub street is 6 mins walk.. best location for me.. you've got everything there.. The staff were super nice. They were very accommodating and helpful. Our room was clean and the food was good. The hotel was next to the night market so it was great for shopping and finding food options. Location, couldn’t be better! The room was so wide and comfortable. The crew is great... smiling faces, friendly, sincere, helping... They all speak English and knows the city very well, so that they can have give you a specific location incase of something that you need; such as they gave me the address for the studio that I could have photos in national customs. 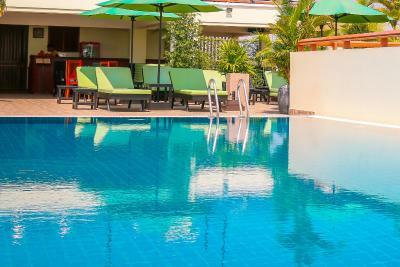 Cheathata Suites Hotel This rating is a reflection of how the property compares to the industry standard when it comes to price, facilities and services available. It's based on a self-evaluation by the property. Use this rating to help choose your stay! 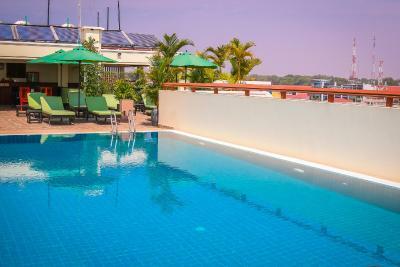 Cheathata Suites Hotel is located in Siem Reap just a short 300 feet stroll from Angkor Night Market. 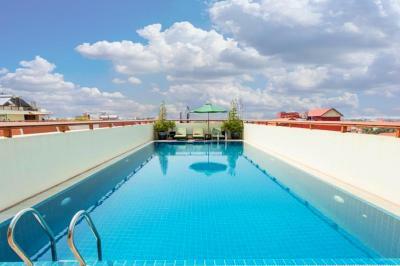 Guests enjoy access to the outdoor swimming pool overlooking panoramic views of the city. Free WiFi is available throughout the property. This modern accommodations is centrally located only 1,000 feet from the vibrant Pub Street. Cambodia’s renowned Angkor Wat is about 4 mi away while Siem Reap – Angkor International Airport is only 5 mi away. The property offers complimentary two-way airport transfer services. Rooms are fully air-conditioned and clean. Fitted with parquet flooring, all the rooms have a mini-bar, seating area and electric kettle. 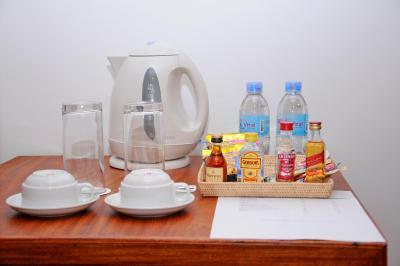 Coffee/tea making facilities and 2 complimentary bottles of drinking water are also provided. The attached bathroom comes with a bathtub, shower, fluffy bathrobes, toothbrushes and free toiletries. Slippers are included in all rooms. A 24-hour front desk will be happy to assist you with meeting facilities, barbecue facilities and currency exchange. 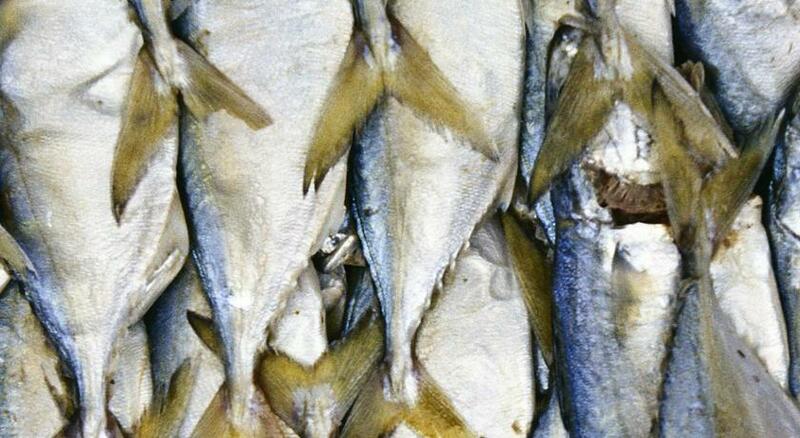 Staff can also arrange for horse-riding, fishing and cycling activities. You can also rent a bicycle or car to explore the area. Both local and international dishes will be served at the in-house restaurant. Light snacks and local beer can be enjoyed at the bar. When would you like to stay at Cheathata Suites Hotel? 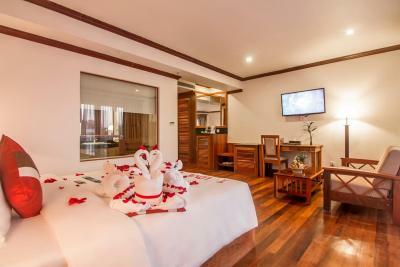 This air-conditioned room features a seating area fitted with a flat-screen TV, Internet TV programs and a mini-bar. It also includes a private bathroom with a bathtub and hairdryer. An elegant suite features a private balcony, seating area and mini-bar. Large windows offer plenty of natural light. The private bathroom includes a separate bathtub, shower facilities and a hairdryer. This air-conditioned suite offers more spacious bathroom units. The room set-up offers unique silk and wood furnishings from the local artisans. Rooms have separate seating area, with a mini-bar and a 42-inch flat-screen internet TV. Elegantly furnished, this luxurious suite features a private balcony with outdoor swing. The seating area is fitted with a flat-screen TV, a sofa and personal safe. The suite is also equipped with a dining area. Private bathroom comes with bathtub, separate shower and free toiletries. The complimentary mini-bar is replenished daily. This twin/double room features a fireplace, bathrobe and air conditioning. The complimentary mini-bar is replenished daily. This elegant suite features a private balcony, seating area and mini-bar. Large windows offer plenty of natural light. The private bathroom includes a separate bathtub, shower facilities and hairdryer. Cheathata Suites Hotel is the priority choice and ultimate location having been made with your stay exceptional and experience. Just one minute walk to the original Night Market, five minutes to the famous Pub Street, and practically a short walking distances to many of attraction places in the city. 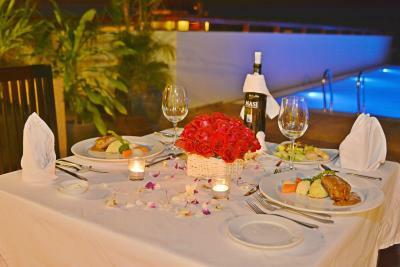 Cheathata Suites strives to make your fun time more creative and relaxed. 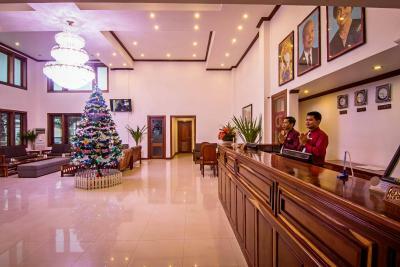 Whether you are enjoying the highlight of historical sites or the beauty of the TonleSap Lake or the fun of nightlife in SiemReap, your journey will never be too far from where you stay. Cheathata Suites offers 38 luxury rooms and facilities with exotic atmosphere by combining both classical and contemporary styles. Room types include Studio Suite, Premier Suite, Junior Suite and Cheathata Suite all have been finely remodeled to include rich decoration by "Mr. Theme" and fine hard wood floor. Each rooms are providing high speed Wi-Fi Internet accessible, TV internet that you can play back in 7days and equipped with full amenity set-up. Cheathata Suites also features a free-form rooftop swimming pool with pure water system and Equinox bar to complete your holiday’s experience with relaxation. House Rules Cheathata Suites Hotel takes special requests – add in the next step! Cheathata Suites Hotel accepts these cards and reserves the right to temporarily hold an amount prior to arrival. Please note that the breakfast set service is only available until 15:00. Please inform Cheathata Suites Hotel of your expected arrival time in advance. You can use the Special Requests box when booking, or contact the property directly using the contact details in your confirmation. Location, market across the street. The location was second to none with the night markets and pub Street within walking distance. 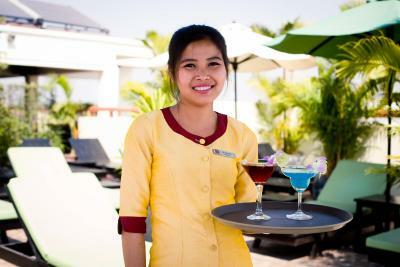 The staff were absolutely phenomenal treating us with great respect throughout our stay. Cannot fault this hotel. Close to pub area and night market. Bed was somewhat uncomfortable - very firm. Great location near restaurants and market. The furniture are old and wardrobe don't look clean. Not enough lighting in the bathroom. The location is good. The bed is comfortable & room is big. Very good location-close to the night life but still quiet. The wi-fi consistently disconnected requiring multiple log-ins and was slow. The biggest strength and weakness of this hotel is its location. 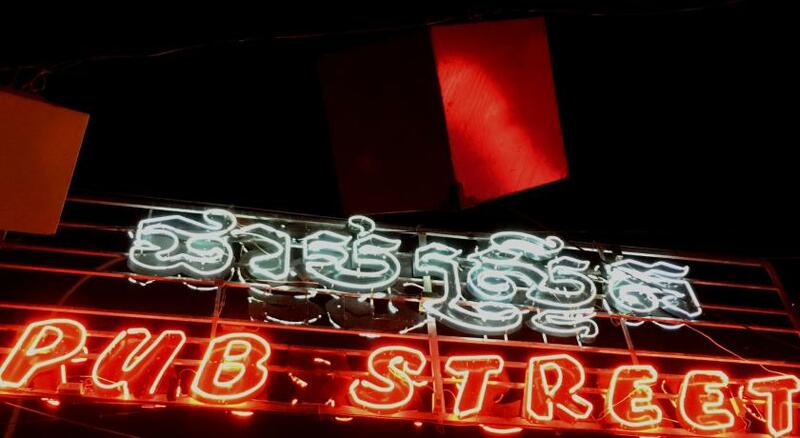 It is convenient to be so close to the Night Market and Pub Street. However, this makes for fairly noisy hotel rooms facing the street both in the afternoon and evening. There is a restaurant directly below the hotel which blared loud music till midnight and maked it difficult to sleep. There are other quieter rooms which face inward but the window faces a corridor making these rooms dark with no view. I stayed at this hotel for 4 nights with a room on the 1st floor facing the street. This hotel offered free tuk tuk rides from and to the airport but I tipped the drivers $1 each. The hotel is conveniently located next to the Night Market and a 5 minute walk to Pub Street. The dated room was larger than expected including the bathroom. Both the bed and pillows were moderately firm but comfortable. The AC had 2 fan levels and was effective on hi at night. The shower had consistent hot water. The room included a safe, small refrigerator, hot water kettle, 2-4 large bottles of water each day, instant coffee/tea, toiletries, bathrobe, slippers and internet TV which had many English stations including CNN, Fox News, BBC, NHK, AustraliaPlus, Discovery. 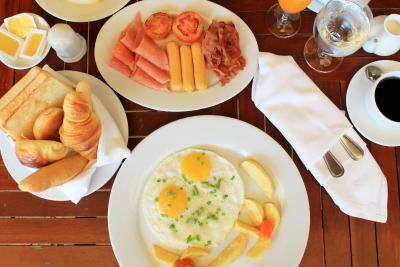 A good breakfast was served from 6am-10am which had a varying selection of hot Asian foods, fresh fruit, breads, cereal, juices, coffee and tea. 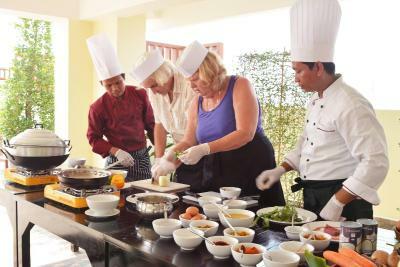 If requested, they will prepare a breakfast to go if you need to leave earlier to view the Angkor Wat sunrise but this will be mainly of dry bread rolls. The lobby, public areas and my room were kept clean. I would recommend this hotel as long as you are not too sensitive to noise. I was tired from trekking through all the temples all day so I fell asleep even with the street noise. There was a problem at the check-out where my credit card was declined but the amount was frozen like a deposit. Had to contact the bank to resolve the issue, but the Reservation Officer was very helpful and answered all my emails about the situation. Walking distance to the center of town and right next to a market. Clean and quite rooms. Friendly staff. Good buffet breakfast. The breakfast room layout was crowded and made it hard to get to things when it was busy (we were there during Lunar New Year so hotel was pretty full) and staff struggled to keep up with resetting tables and refilling buffet items. Could be that they were just a little understaffed at the time. But the staff that were there were really responsive and happy to help. big room.very central location. clean. very very nice. The breakfast could be made better. The pool on the terrace was too small. Location was great! 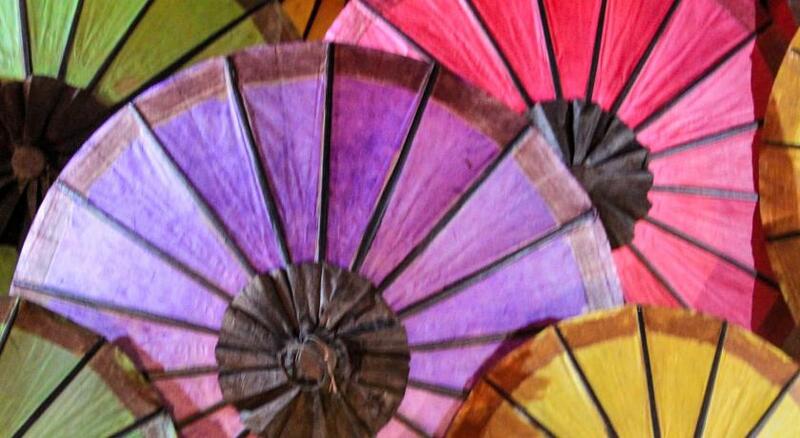 Handy for night market and Angkor Wat. The staff was helpful. We were upgraded to a bigger suite without even asking for it, which was nice.